DART, ERNEST, Jacksonville attorney since 1914, prominently connected with the professional and business interests of Florida, is a member of an old and distinguished Georgia family, and he laid the basis of his reputation as a lawyer in that state. 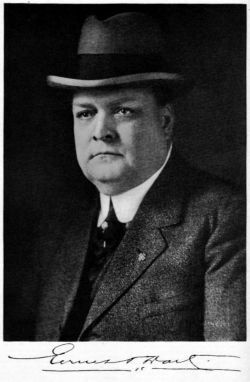 He was born at Brunswick, Georgia, February 22, 1872, son of URBANUS and ANGELA (McCONN) DART. His father was born in Brunswick. Georgia, in 1840, and died in 1911, and his mother was born at Quitman, Georgia, in 1850, and died in 1907. They were the parents of two sons and two daughters, and the two now living are ERNEST and Mrs. RUSSELL RICHARDS, of Atlanta, Georgia. URBANUS DART was educated in a military school at Marietta, Georgia. He was a member and captain of the Brunswick Rifles, and at the outbreak of the Civil war joined as a member and captain of that company, Stonewall Jackson’s command, as a sharpshooter, and served in Jackson’s Brigade during the Civil war. The Brunswick Rifles is the only military organization in the south that has been maintained continuously since 1861. At the last reunion of the survivors of the old company in 1921 there were only three members left, HENRY HOLMES, JOHN J. SMITH and J. J. SPEARS, all of Brunswick, Georgia. After the war URBANUS DART practiced law at Brunswick for a number of years, and later was engaged in the steamboat business. At the battle of Gettysburg he captured a sword belonging to R. C. KNAGG of a Michigan regiment, and at his request the sword was laid on his breast and buried with him. He was a member of Ocean Lodge No. 241, F. and A.M., of Brunswick, Georgia, served as alderman and mayor of Brunswick, was a democrat and a member of St. Mark’s Episcopal Church. ERNEST DART was carefully educated attending North Georgia Military School at Dahlonega, Georgia, and in the University of Virginia he studied law under the eminent jurist and law teacher, JOHN B. MINOR, who was dean of the law department of the University of Virginia for fifty years. Mr. DART left the university with the class of 1892, and for over twenty years he carried on a successful general practice at Brunswick, Georgia, being local counsel of the A. C. L. southern and A. B. & A. railroads. In 1914 he removed to Jacksonville and in addition to practice in all the courts he acts as special counsel for the Atlantic Coast Line Railway Company. While in Georgia Mr. DART served two terms as county attorney of Glynn County, was elected to the Legislature in 1898, but resigned his seat to join the army during the Spanish- American war. He went into the service as captain of the Brunswick Rifles, his father’s old company, and he wore the captured sword belonging to his father in the Civil war. He was honorably discharged November 18, 1898, and was appointed major and lieutenant-colonel of Georgia Volunteers after the war. Mr. DART was appointed solicitor, City Court of Brunswick, Georgia, February 8, 1909, by governor HOKE SMITH, serving four years, and throughout Governor Smith’s administration he was a lieutenant-colonel on the governor’s staff. Mr. DART was affiliated with Ocean Lodge No. 214, F. and A. M., at Brunswick, Georgia, and was also a member of the Benevolent and Protective Order of Elks, Independent Order of Odd Fellows and Knights of Pythias, at Brunswick, Georgia. For eight years he was organist of St. Mark’s Episcopal Church at Brunswick, and is now a member of the church of the Good Sheppard at Riverside, Florida. He is a lifelong democrat in politics. Mr. DART traces his ancestry back to Sir JOHN DART of Devonshire, England, and the first of the family in this country was Dr. CYRUS DART, who served as a surgeon in the American army during the Revolutionary war. Mr. DART’s ancestors also saw service in the Mexican war in 1812. Mr. DART is eligible to membership in the Sons of the Revolution and is a member of the Sons of Confederate Veterans and a past commander of Thomas W. Woodruff Camp of the Spanish-American War Veterans of Jacksonville. In 1901 Mr. DART married HELEN FORSYTHE, daughter of JOHN C. FORSYTHE, a native of Inverness, Scotland. Her mother was EMILY COMPTON, a cousin of CHAUNCEY M. DEPEW. Mr. DART lost his first wife in 1911. Their three children are: EMILY ANGELA, ELINOR WINN and ROBERT ERNEST. On December 29, 1912, Mr. DART married CAMERON LAY, a native of South Carolina, of Scotch ancestry and related to the distinguished Holt and Hickman families of North and South Carolina. They now live at 1824 St. Johns Avenue, Jacksonville, Florida.